Compare Non-Electric Pressure Cookers: Presto or Fagor? With pressure cooking, foods are cooked much faster than in conventional cooking, without wasting any of the rich nutrients found in the ingredients while at the same time enhancing the flavors. Indeed, foods cooked in pressure cookers end up being both tastier and healthier. Because of how they work, pressure cookers also allow you to prepare meals you might not have cooked otherwise, such as using tough cuts that can be cooked to tender doneness in under an hour, saving both money and effort. Food ingredients and some liquid are placed in the cooker, the lid is locked, and the cooker is placed on heat. The pressure is kept at a relatively high level all through the cooking period which results in much faster cooking time. When compared with conventional cooking modes, cooking with a pressure cooker requires much less energy and and a smaller quantity of liquid. As a result, the flavors are enhanced while the nutrients in the food are retained. After cooking is complete, it is required to release the pressure before opening the lid. You should always read carefully the user manual of your pressure cooker to find out about the recommended method of releasing the pressure. NOTE: This article will compare standard non-electric pressure cookers. If you’re interested in a comparison of electric pressure cookers, please click the following link to an article that compares multi-cookers which are electric cooking utensils that have multi-functions such as pressure cooking, slow cooking, sautéing, steaming, etc. : Compare Best Multi-Cookers. The most popular non-electric pressure cookers are made by Fagor and Presto. Other more expensive brands exist, but this article will compare pressure cookers Fagor and Presto since they are the two most widely bought brands. In particular, the FAGOR Duo 6-Quart Pressure Cooker will be compared with the Presto 6-Quart Pressure Cooker as 6-quart units are the most practical. But pressure cookers in 4, 8, 10 and 23 quart sizes are also available and can be obtained below. 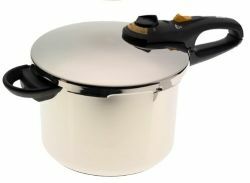 The Presto 6-Quart Pressure Cooker measures 9 inches in diameter (17 inches with the handles) and is 8.5 inches tall including the lid. It has sturdy handles that make the cooker safe and easy to carry when full. It is made of stainless steel with an aluminum encapsulating base for fast and even heating. The lid is heavy-duty and it locks down easily for safe cooking. There is an inner sealing ring that makes sure that the steam generated during cooking stays locked inside. The unit is also equipped with a pop-up pressure indicator coupled with a steam release mechanism and an overpressure plug that will release any excessively built steam. Presto guarantees this pressure cooker with an extended 12-year warranty. A detailed instruction and recipe booklet is included. Cleaning this cooker is also very easy as it is completely immersible in water, but it is recommended to use non-abrasive cleansers to keep the stainless-steel shine. The inner ring should also be removed after each use for thorough cleaning of the lid's inner rim and the ring. The Presto pressure cooker may not look as fancy as the Fagor unit described below, but it works very well. Replacement parts are easy to get, and most important, it's very safe to use. Most Amazon customers who have used this pressure cooker have been quite happy with the cooking results. Note that Presto makes also 4 an 8 quart pressure cookers with the same quality and features. See below for details. All Fagor pressure cookers are made of stainless steel and have very stylish designs. They come with good safety features to prevent excessive pressure build-up and accidents. The Fagor Duo 6-Quart Pressure Cooker measures 9 inches in diameter (17.5 inches with the handles), is 9.5 inches tall, and weighs 8 pounds. It is constructed of high-quality stainless steel with an encapsulated aluminum base for even and efficient heat distribution. It comes with ergonomically designed sleek and sturdy handles and is capable of cutting cooking time by a large amount (as much as seventy percent). It is equipped with a triple-safety system that prevents opening before all the pressure is released. It also has a dual pressure settings and an automatic pressure release feature. A visual pressure state indicator lets you know when all the pressure has been evacuated and the cooker is safe to open. The cooking pot is dishwasher-safe, but the lid needs to be hand washed. It comes with an instruction manual, recipe book and a 10 year warranty! Amazon customers using this pressure cooker were in general very happy with the cooking results obtained. You will feel extremely safe using this cooker as the lid locks perfectly, and the visual pressure state indicator lets you know when you can safely remove the lid. There is really nothing complicated about using this pressure cooker. When you compare pressure cookers, this one is sure to come on top when the value you get for the price is considered. Note that Fagor manufactures this pressure cooker also in 4-quart size with the same quality and features. See below under Amazon offerings for details. So which pressure cooker to buy? When you compare pressure cookers Fagor and Presto, you find that both cookers will perform to your satisfaction as they are both made of stainless steel and both have an aluminum layer encapsulated in their base. However, Fagor has more safety features built in and is more stylish looking. If you can afford the few extra dollars to buy a Fagor, you should definitely get it. Otherwise, you will also be quite pleased with the Presto cooker. The main point to remember before buying a pressure cooker is to get one made of stainless steel (for easy cleaning and extended durability) and with an aluminum layer encapsulated in the base (for good heat distribution). Both products described here provide these features. 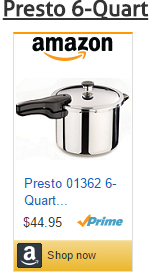 Note that Presto also makes pressure cookers made completely of aluminum. We don't recommend buying those as they will tarnish with extended use. But they cost much less and therefore should only be considered if an aluminum encapsulating stainless steel unit can not be afforded. You can buy 6-quart, 4-quart, 8-quart and 23-quart Presto pressure cookers below. You can buy the 6-quart and 4-quart Fagor Duo pressure cookers below. Two great pressure cooking recipe book. Offering hundreds of recipes that are proven to work--and proven delicious--plus plain-English answers to all of your pressure-cooker questions. The writer has created the single most useful pressure-cooker book ever published. It's a resource you'll turn to again and again as you explore the world of pressure-cooking.